Students from across the UK participated in the international challenge, Mission X: Train like an astronaut. Since January, schools from Cornwall through to Scotland and from Wales through to Norwich have been taking part in the international Mission X challenge: a series of science, fitness and nutrition missions in the context of training like an astronaut. Now these schools, and other Mission X schools from across the world are celebrating the close of Mission X: Train Like an Astronaut 2014. Together they have proven that young people from across the world have the right stuff to reach for the stars. 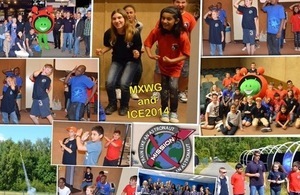 Mission X is an international educational programme designed by NASA and led in the UK by the UK Space Agency. It aims to inspire interest in science, nutrition and fitness in school students aged 8 – 12 years old by using astronauts as role models. It uses missions within an astronaut training context to teach how good diet and exercise play an important role in human performance in space and on Earth. Each successful Mission X mission counts towards helping the Mission X Mascot Astro Charlie walk to the Moon on the international website www.trainlikeanastronaut.org. As of 14 March, Astro Charlie has now landed on the Moon, with ESA mascot Paxi, thanks to the efforts of children across the world. Last week, in celebration of this achievement, two groups of students from the UK attended the 3-day Mission X 2014 International Closing Event at the Euro Space Centre in Belgium. During the event they experienced first-hand both the international nature of space exploration and the challenges of training to be like an astronaut, including experiencing apparent weightlessness and undertaking a shuttle launch simulation. The students met ESA astronaut, Frank de Winne, the first ESA astronaut to command the ISS and the current Head of the European Astronaut Centre in Cologne, Germany. Students also had the opportunity to share their Mission X experiences with other young people from across the world. The International Closing Event for 2014 had a perfect setting at the Eurospace Centre in Belgium. Students from across Europe worked together on space missions and had firs- hand experience of the international nature of space exploration and astronaut training. We were delighted that students from the UK were able to join us and have been impressed by the Mission X programmes in Northbury Junior School, Barking and St Patricks School, Salford. It’s been a fabulous experience for the children. They have been able to take part in astronaut briefings and simulated missions. I can see their communication and science skills have developed during the International Event. I loved it all but it was especially fun walking on the Moon and meeting Belgian astronaut Frank De Winne. Back in the UK, schools have been holding a range of celebratory parties and events to celebrate their successes. Mountfitchet Mathematics and Computing College, near Stansted, hosted a fashion show inspired by space. The starry designs were tweeted across the world and attracted twitter praise from astronauts Tim Peake, Richard Garriott and Samantha Cristoforetti. Northbury Primary School in Barking and Dagenham planned a whole week of landing activities including rocket launching with Out of This World Learning, and astronaut fitness checks led by Classroom Medics. The students work was tweeted to astronauts who loved the designs and artwork featuring on their mission logs. Richard Garriott and Tim Peake were even discussing potential asteroid landing sites based on the children’s drawings. An exciting range of regional landing events have also been organised across the UK. On 3 June QinetiQ in Farnborough ran a ‘Spin Your Teacher’ event for Mission X schools using their man-carrying centrifuge - a specialist facility used to prepare fighter pilots and astronauts for the high G forces of air combat and launch/re-entry. Students were able to conduct pre-flight tests on their teachers and then watch them experience G forces of up to 4.4G on the centrifuge, thus witnessing the physiological effects of the Earth’s gravity in the laboratory. Upcoming closing events include events at the University of South Wales, the National Space Centre and the Farnborough Airshow. More information on the Mission X: Train Like an Astronaut programme can be found on the Mission X website.